Writer Laurie Woolever experiences the best parts of camping (hiking, canoeing and being at one with nature) while someone else does all the heavy lifting. It’s a little like backpacking, without actually having to carry a backpack. 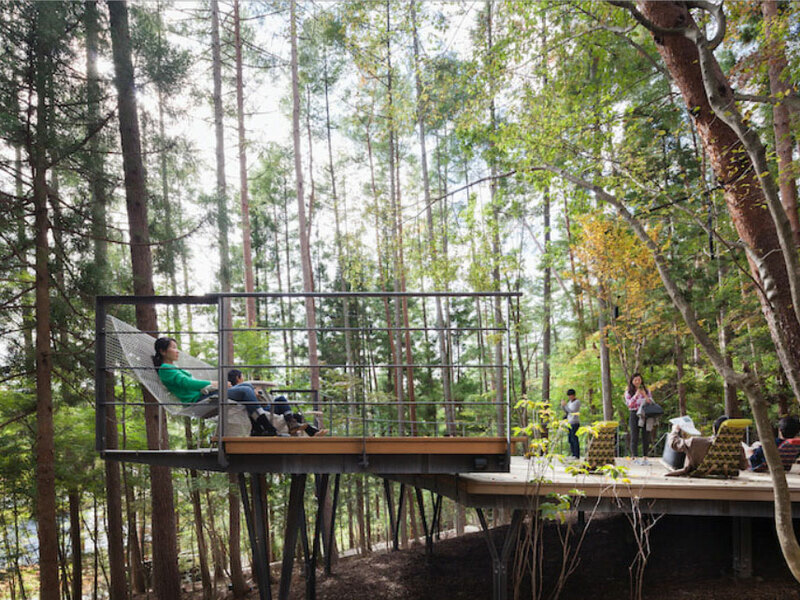 The previous day I’d taken a bento box and two trains in my retreat from the roaring August heat and humidity of Tokyo, emerging in the only slightly cooler but far more serene Lake Kawaguchi area, to visit Hoshinoya Fuji, billed as “Japan’s first glamping resort.” I was, and remain, irritated by the word “glamping”—a cloying portmanteau of “glamour” and “camping” that is, of course, in the Oxford English Dictionary, along with “manspreading” and “listicle.” Still, I was eager to experience the thing of glamping—which is to say, vacationing in a rustic setting, perhaps even sleeping in a safari tent or teepee, without relinquishing the comforts of soft bedding, ample hot water and restaurant-quality food. Though the concept isn’t exactly new, it lately has exploded into its own trendy travel category. 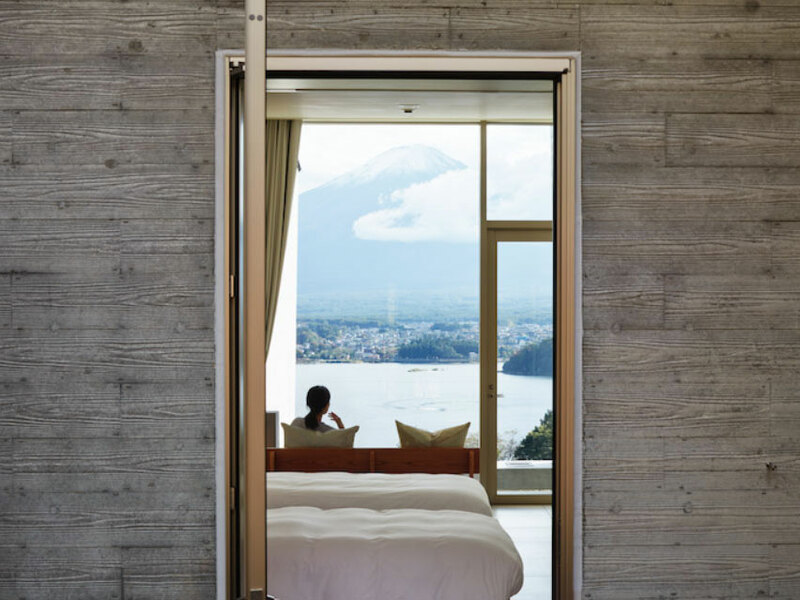 Arriving at Hoshinoya Fuji, I was greeted by 40 minimalist but luxurious cabin rooms, plus a full-service dining room and a scattering of indoor/outdoor public spaces—all stylishly built into a hillside, set in a lush red cedar forest, overlooking Lake Kawaguchi. I’ve done enough old-school camping to know that the best parts are the clean forest smells, the excuse to eat a lot of carbs and the shower you take when it’s all over. The rest, to me, is clammy, buggy, indignant drudgery, from load-in to bartering dry socks for anxiety meds (or at least a melatonin) to breakdown. Everything takes longer than it should, and nothing’s ever the right temperature. Glamping, on the other hand, is the illusion of work and ruggedness. (Think of it as like transferring prepared foods into your best serving dishes and adding a sprinkling of cut chives on top before guests arrive.) Essentially you’re playacting, with an emphasis on props. Sure, I’m wearing a headlamp, but it lights the wooden staircase back to my climate-controlled room, where a deeply compliant Japanese toilet with a heated seat awaits. I might chop wood or paddle a canoe or hike among the trees, but only under the gently watchful supervision of a “glamping master” who has just delivered a 20-minute safety lecture on the topic. Nowhere are the props of pretend camping at Hoshinoya Fuji more in play than when it comes time to eat. Much of the food—including soft-shell turtle, trout, eel, venison, wild boar, and a range of fruits and vegetables—is hunted, fished, foraged or otherwise sourced locally. Not by the guests, of course. Breakfast, if ordered to your room, arrives in a stylized fishing tackle box that’s fitted inside a wood-framed backpack modeled on those once used by the 19th-century Mount Fuji guides known as goriki. On the first night, I had the Dutch oven dinner, and each of its seven courses required some effort on my part. That meant salting the tiny, deep-fried sweet fish that appeared to still be swimming, for instance, or grating Parmigiano over the Italian-style stew of venison tripe in an adorable cast-iron mini pan before a glamping master heated it through on a tabletop burner. The next night, after starting with a transcendently simple and profoundly delicious soup of green peppers and miso, served in the main dining room and requiring no work from me (apart from spoon to mouth), I was invited to approach the freestanding grill area and cook my own main course. Chef Yuji Kanai told me exactly when and how to turn my steak so that it was rare and had perfect crosshatch grill marks, before making a dramatic-looking pan sauce by flaming some high-end Japanese whiskey. It was like being in the cleanest, quietest, most exclusive Benihana ever, though that funny little tent housing my choice of salts, pepper, lemon and herbs reminded me that I wasn’t just dining—I was glamping.